I’m not an artist, that’s for sure, but I did get my backdrop painted. This is what I have learned from this experience and may help you. I used the smooth sheet rock wall to paint my backdrop on, I figured if we ever moved, I’d have to repaint the room anyway and know my next backdrop will be even better. Blue sky isn’t the same color blue everywhere, especially if your modeling the Los Angeles area. I used a photograph of the San Fernando Valley taken on a not so smoggy day, then matched the blue sky in my photograph to a True-Value Hardware paint sample card. You’ll notice in the real world that sky get lighter towards the horizon, almost to white. I bought quart can of each color needed, Light Blue and for the white, I used a True Value color called Silver Sand. I set a piece of Masonite on the wall brackets that works as a table for holding my paints and brushes, also keeps drips off the floor. 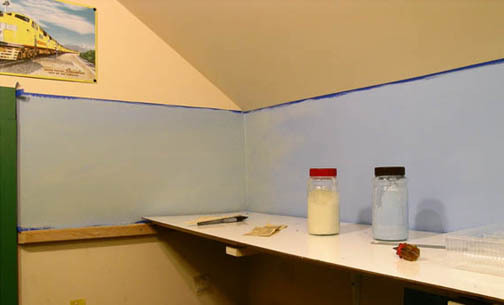 I prepped the wall by filling all those picture hanging nail holes with filler and smoothed with fine sandpaper and used blue painters tape to edge my masterpiece. 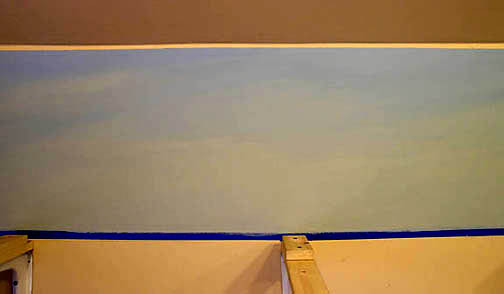 I started with the Light Blue for the first coat, it looked a bit dark at first, but a second coat of Light Blue and also mixing with Silver Sand lightened up towards the horizon made the sky look better. I use a 1 1/2″ wide brush to do my painting. 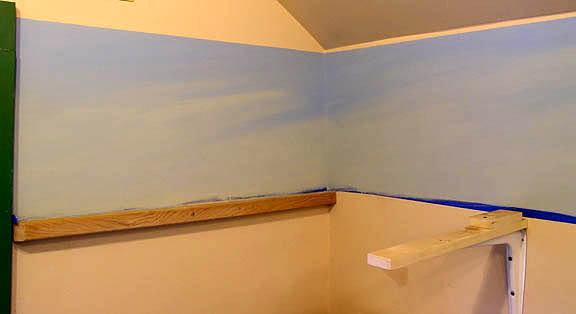 Don’t rush, keep the wall wet with paint as your adding the Silver Sand color, work only several feet at a time. Watch for runs, so keep a rag handy. While working the Silver Sand with the 1 1/2″ brush, I painted the softer looking clouds midway in the backdrop (these are the easiest clouds to paint), and continuing into a haze to the horizon.